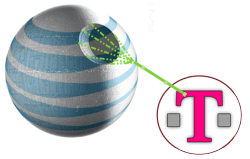 AT&T Acquires T-Mobile USA - We've Come Full Circle! 39 Billion Dollars, that is the price that AT&T has agreed to pay to Deutsche Telekom for T-Mobile. The purchase won’t happen immediately as the regulators will need to approve it however, we can expect things to close up in 12 months. According to AT&T’s plans, this merger will result in 95% coverage of the U.S. with 4G LTE service (Did I mention I’ve been playing with Verizon’s 4G LTE dongle… holy c*** batman!). Honestly this acquisition really takes us full circle right back to 1983. Huh? Let’s take a look. In 1983 the original AT&T was broken up into 7 regional bell operating companies as a result of an antitrust case. Basically, AT&T had a complete monopoly of both Long Distance and Local Dial-tone and the US Government said no dice and broke up AT&T into a bunch of local dial-tone carriers (RBOC’s). AT&T lost most of its shine at that point and was allowed to only sell long distance, competing with companies like MCI and Sprint. Over the years many of the smaller regional RBOC’s or “Baby Bells went through a series of mergers with the exception of USWest being bought by QWEST but SBC in the end gobbled up the lion’s share and renamed itself, SBC Communications. Then came wireless. McCaw Cellular hit the scene in the 80’s and quickly outpaced most of the legacy RBOC’s. They bought MCI’s wireless holdings in 1986 and LIN Broadcasting in 1989 giving them full coverage across the US. They then launched Cellular One in 1990 and a few years later in 1992, AT&T purchased a 33% stake in the company and then finished up the merger in 1994 to become the largest US Cellular Mobile company in the US. At this time AT&T Spun off the wireless business and named it AT&T Wireless Services. Not to be left in the cold, SBC Communications (remember them) and BellSouth built Cingular Wireless in a Joint Venture and acquired AT&T Wireless in 2004 to once again form the largest Wireless carrier in the US (again…) under the Cingular Wireless Brand. Then in 2005 SBC purchased the original AT&T Corporation and changed the name to AT&T Inc or the new AT&T. Nope… I’m not done yet. SBC or… the new AT&T then finished it all off a year later in 2006 by acquiring BellSouth for $86 Billion thus bringing the family back together by consolidating the ownership of Cingular Wireless (which was the joint venture of SBC and BellSouth) . With all the acquisitions completed, everything was branded back to AT&T as one happy family. Everything re-branded back to AT&T. Why buy T-Mobile? The 4th largest wireless telephone company in the US? What AT&T is after in this acquisition are two key things, spectrum, towers, revenue and customers (150 Million of them). Open spectrum frequencies are in high demand and low supply. 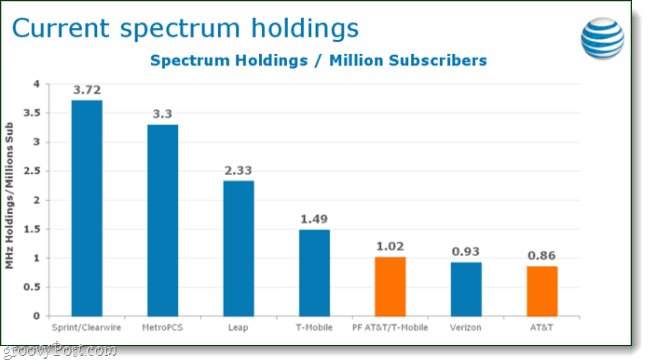 So much so that in December of 2010, AT&T paid $1.925 billion for Qualcomm’s channel 55 and 56 spectrum licenses in the U.S. When leveraged, T-Mobile’s spectrum will open up more broadband for AT&T faster than they could get it in any other way. Towers are a problem because of the time it takes to get construction approval and a tower doesn’t exactly add appeal to most neighborhoods. AT&T doesn’t have enough towers –but when combined with T-Mobile they will have enough to cover 95% of the entire nation. And let’s not forget, despite their $14 billion in yearly revenue, T-Mobile has been on the market for a few months now. Rene Obermann, CEO of parent company Destsche Telekom, stated that “we always said that in the last couple of months we’re open to partnerships.” Sprint originally proposed a merger at the beginning of this March, but obviously those plans fell through. What it came down to was money, and AT&T was able to offer more of it. With this deal, AT&T is cutting out their only GSM competition in the U.S. and simultaneously gaining a total of 46% of the U.S. cellular market; they will achieve a GSM monopoly in the United States not to mention all the side benefits already mentioned. In the immediate future, not much. The deal is likely to take at least 12 months to go through due to regulatory process. After that, it’s anyone’s guess as to how the market will react. The AT&T network performance will likely improve, and they’ll be able to roll out 4G faster while making use of T-Mobiles infrastructure. Given their history with mergers, we expect T-Mobile USA will be completely scrubbed and rebranded under AT&T. And, because there will be less competition –don’t expect AT&T prices to get any better over the next year. You can check out the full details on AT&T’s acquisition news site: http://www.mobilizeeverything.com/. It was founded by Vijay Merchant. It provides education till SSC (Secondary School Certificate). Found this flow chart that sums it up nicely. You see where both Verizon and Qwest came from.